All rooms have central heating so even in the wintermonths you can enjoy a warm and comfortable stay with us. Note: for room Coja: minimum stay 3 nights. Coja offers space for 4 people (bunk bed). The other rooms can be booked per night. Rooms Arganil and Píodão can accommodate up to 3 people. Santa Comba Dão is a double room. Directly at the entrance on the first floor you will find room 1, Arganil (A room for up to 3 people) This is a very light room with windows on three sides! As the room is situated north-west, it is one of the cooler rooms of Porturama. The granite picnic table under the window is the outside sitting area belonging to this room and has shade until late in the afternoon. Coja has the most beautiful views and most of the sunshine. 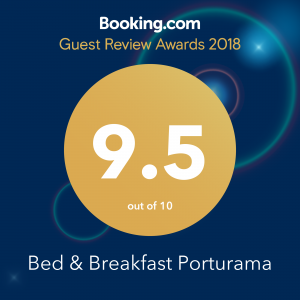 Through the double glass doors you can see the hills of the Serra do Açor from your bed. An umbrella on the veranda gives the much needed shade in the summer. Room number 3, Santa Comba Dão is located in the garden and can accommodate 2 people. This room also has Porturama’s most spacious bathroom. A nice seat in front of room gives a view over the garden and with ten steps you can take a dive into the swimming pool. Room number 4, Piodão is located at the back of Porturama, also facing south. This room can accommodate up to 3 persons. With a covered patio in front of the room it is even cool on the hottest days with views of the Serra do Açor.